WASHINGTON (June 16, 2009) -- A water-cooled vest can take the heat off in Iraq -- making Soldiers more comfortable, and extending mission times. As part of an Army birthday-related event June 12, in the Pentagon courtyard, representatives of Program Executive Office Soldier displayed to visitors some of the technologies they are fielding or plan to field -- including a water-cooled vest, a lighter machine gun, and a common control panel for unmanned vehicles. 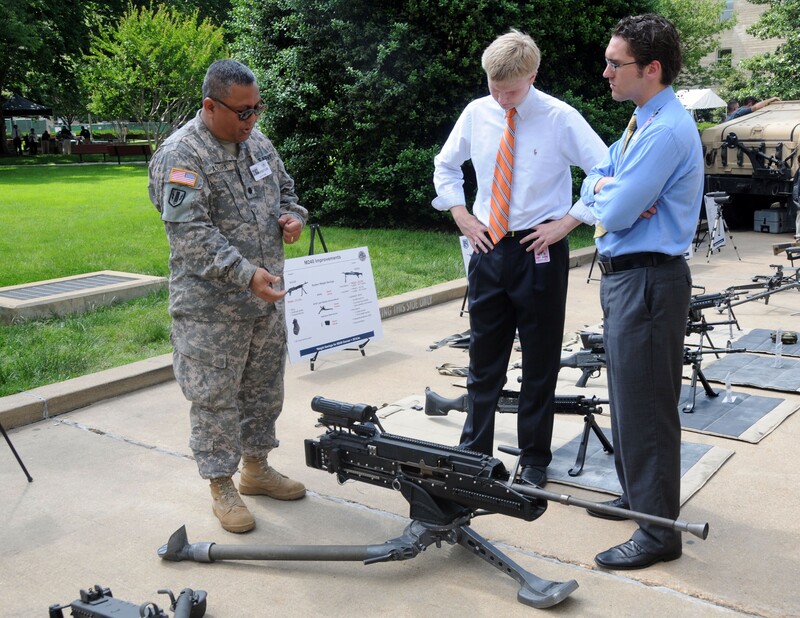 Lt. Col. Mike Ascura, product manager for Army crew-served weapons, discusses the XM-806 lightweight .50-caliber machine gun with visitors in the Pentagon courtyard, June 12. Scott Senter, of PEO Soldier's Mounted Soldier System Program, displayed a micro-climate cooling system for mounted Soldiers, similar to one already used as part of the Air Warrior system. "It'll allow the drivers, commanders and gunners and the scouts to wear a vest underneath the body armor that will allow them to run longer missions than they are today so their body will stay at a constant cool temperature in hot vehicles when they are standing up out of turrets," said Senter. "It'll keep their body at a constant 68 to 70 degrees instead of being at 112 that we were seeing when we were deployed." The one-pound vest is lined with coils of tubing through which cold water is circulated. The chiller is a small metal box that can be mounted inside a vehicle next to the turret or driver's compartment. Soldiers connect the vest to the chiller via a quick connect cable. "We had it deployed with the 4-9 Infantry Battalion in Iraq with the Strykers, for the drivers only," Senter said. "And it's being put out in Abrams and Bradley (now). They love it. They don't want to leave without it. If it's not working or functioning, they make sure it is before they go out for a mission." Chaplain Col. Dan Minjares tried on the vest, saying it makes a noticeable difference. "You can feel the difference right away, even through your shirt," he said. "But you'd wear this underneath your shirt -- it'd be really good. It's not real heavy either, so it's not adding to the weight you carry." Senter said keeping Soldiers cool in the desert heat isn't just about comfort, it's about their mission as well. Soldiers lose the ability to concentrate when they are overheated. "With this, keeping you cooled down during the mission, your situational awareness will stay peak," Senter said. For pilots who are already using the cooling system, the cooling effects of the equipment has enabled them to increase mission time. "Pilots were able to do an hour to an hour-and-a-half mission," Senter said. "Now they can go to five or five-and-a-half hours." Reducing the heat is only one challenge PEO Soldiers is trying to accomplish for Soldiers in Iraq. Reducing the load is another -- and less weight affects Soldiers in any climate. Brig. Gen. Peter N. Fuller is the Program Executive Officer, Soldier, at Fort Belvoir, Va. He said the focus for PEO Soldier is not just on reducing the weight of body armor, but on modernizing all Soldier equipment to make it lighter and more effective. "For the average Soldier, there is such a variation difference in what they are carrying. We've seen 100 pounds to 150 pounds," Fuller said. "We're just trying to get any area we can to reduce their weight. This is a modernization effort. As we modernize the Soldier, we are trying to improve the capability, which also lightens them and gives them better capability. We are trying everything. Modernization is sometimes a lighter system, sometimes just an improvement, sometimes both." Lt. Col. Mike Ascura, product manager for Army crew-served weapons, discussed the XM-806 lightweight .50-caliber machine gun, saying the weapon is lighter and easier to acquire a target with than the M-2. "It's an experimental weapon, in development, that is supposed to be augmenting M-2," Ascura said. "We've incorporated that technology into the lightweight .50-caliber machine gun. For instance this .50-caliber now has a fixed headspace and timing. And what that means is that you don't have to gauge the barrel every time you change the barrel." The biggest difference between the XM-806 and the M-2 is the weight. The XM-806 weighs about 40 pounds. The M-2, by contrast, weighs more than twice that. And the recoil on the M-2 is about 1,000 pounds, for the XM-806, about 250 pounds, Ascura said. "What this means for a Soldier is that he can actually fire this lightweight machine gun and use a fire control device that will accurately guide him to the target in the first three rounds," Ascura said. The weapon is still in development, the colonel said, adding that PEO Soldier plans to field it sometime in 2012. Out in the field now Soldiers are already using unmanned aerial vehicles and small unmanned ground vehicles -- known as SUGVs -- as well as various sensors. Controlling all those devices remotely may eventually fall on the shoulders of Soldiers wearing the common controller developed by PEO Soldier. The controller consists of a computer and radio tied to a hand-held controller and will eventually control up to 17 different weapons platforms. "Whatever I'm operating, it will give me a live feed," said Staff Sgt. Bernard Arroyo with the Army Evaluation Task Force at Fort Bliss, Texas. "It'll give me the status on the vehicle, the speed and the battery life. It'll also feed information from the squad level all the way to the brigade tactical operations center." Arroyo has used the common controller during experiments down in Texas to control the SUGV, among other things. "We did operations there -- route clearance -- out of the back of our Bradleys," he said. "We'd drop the ramp and send the robot out and the guy was wearing this. We did route clearance, sending the robot out to check for possible improvised explosive devices. And we ran into some wires, so we did wire-breaching operations too." Right now, the whole controller weighs about 30 pounds -- it's both bulky and hot too. But Arroyo said he knows that the controller is destined to get lighter and leaner for Soldiers. "We are upgrading, and eventually it'll weigh 12 pounds," he said. "It won't hang outside the modular lightweight load-carrying equipment vest, it'll be inside the vest, integrated inside the vest where you can't see the cables or boxes." While the controller is heavy and bulky now, Arroyo said the benefit to Soldiers is clear, the device allows a Soldier to send his eyes and ears out on the back of a machine. "It definitely gives you situational awareness -- and it's definitely better to send a robot than a Soldier," he said. "And you can send this out before you send human life out -- that's the whole purpose."